Sample paper of class 12 Hindi Core with solution download free in PDF format. myCBSEguide provides CBSE Sample Papers for Class 12 Hindi Core and guess papers for board exam. Hindi Core sample paper for class 12 have 26 questions. The new marking scheme and blue print for Hindi Core class 12 have been released by CBSE. We are providing Hindi Core sample papers for class 12 CBSE board exams. The best sample papers for Hindi Core class 12 now available for free download in our myCBSEguide app, best app for CBSE students.These are the latest Sample Paper for class 12 Hindi Core as per the new board exam pattern. Download the app today to get the latest and up-to-date study material. CBSE sample paper for class 12 Hindi Core with qustions and answers (solution). Download best sample papers for XII Phyics CBSE annnual exam with fully solved question papers. cbse class 12th Hindi Core sample paper gives an idea of question paper pattern and marking scheme. Class 12 Physic have 10 uints and total 16 chapters. The annual exam sample paper for Hindi Core will comprise questions from all chpaters given in CBSE class 12 NCERT text book. CBSE follows NCERT syllabus in class 12 board exams. Class 12 Hindi Core have two NCERT books. We provide Hindi Core sample paper with solution which includes questions from all the chapters. Central Board of Secondary Education, New Delhi issues sample question papers for all major subjects. Class 12 Hindi Core sample questions papers help students to prepare for board exams well in advance. 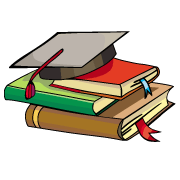 Student can download cbse sample papers for class 12 and practice the questions at home. Hindi Core sample paper have questions from NCERT class 12 Hindi Core book, NCERT help book, CBSE books for class 12 Hindi Core and other text books prescribed by CBSE for class XII Hindi Core exam. Sample paper for class 12 Hindi Core and other subjects are available for download as PDF in app too. 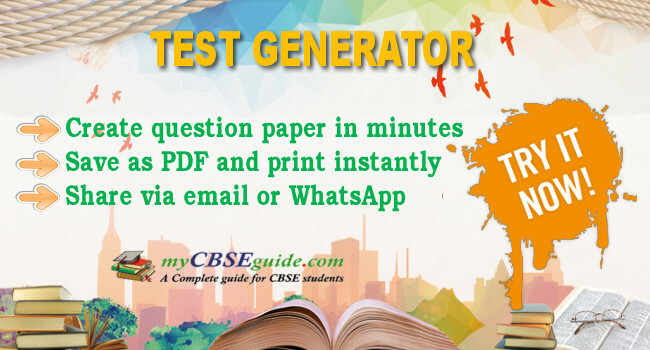 myCBSEguide provides sample paper with solutions for the year 2018, 2019, 2020. Note: The above information may change in course of time. Users are advised to corelate the same with latest CBSE sample paper for class 12 Hindi Core. Download CBSE sample paper for class 12 Hindi Core from myCBSEguide. Class 12 sample paper of Hindi Core for board exams are available for download in myCBSEguide app, the best app for CBSE students. Sample Paper class 12 Hindi Core includes questions from Hindi Core Part-I and II(Published by NCERT), Laboratory Manual of Hindi Core(Published by NCERT), The list of other related books and manuals brought out by NCERT(consider multimedia also). CBSE conducts board exam for CBSE students which will cover the whole book. CBSE follows NCERT text book in class 12 Hindi Core. Here is the list of chapters in NCERT class 12 Hindi Core. The sample question paper with solution for class 12 Hindi Core is prepared as per these NCERT text book chapters. Hindi Core sample papers and annual exam question papers of class 12 Hindi Core are based on these chapters only. CBSE Sample Papers for Class 12 Hindi Core with solutions, blue print and marking scheme in PDF format to free download. Hindi Core NCERT Solutions of all subjects and Hindi Core NCERT books in PDF form along with Previous years papers of the region All India, outside delhi, Foreign and Delhi set 1, set 2 and set 3 with marking scheme issued by CBSE board, New Delhi. (ग) ‘आत्म दीपोभव‘ का सिद्धांत क्या है? (घ) भाग्यवादी सफल क्यों नहीं हो पाते? (ड.) सफलता प्राप्त करने वाले व्यक्ति की क्या पहचान होती है? (च) युद्ध से गुजरने का क्या अभिप्राय है? (छ) किन जीवन मूल्यों के आधार पर हम अपने लक्ष्य को प्राप्त कर सकते हैं? (ज) सशक्त विचार शक्ति और कठिन परिश्रम से आप क्या समझते हैं? (क) कवि ने मुसाफिर किसे कहा है और क्यों? (ख) धरती को अचला नहीं चंचला क्यों कहा गया है? (ग) साँस चलने से कवि का क्या आशय है? (ग) पीत पत्रकारिता से क्या आशय है? (घ) फ्रीलांसर पत्रकार किसे कहते हैं? (ड.) एंकर बाइट किसे कहते हैं? (क) कवि जीवन की प्रत्येक परिस्थिति को सहर्ष क्यों स्वीकार करता है? (ग) कवि किसे मौलिक और नवीन मानता है तथा क्यों? (क) कवि ने अट् टालिका को आतंक-भवन क्यों कहा है? (ख) क्षुद्र प्र फुल्ल जलज- क्यों कहा गया है? (घ) रोग-शोक किसे दु खी नहीं कर पाते और क्यों? (ग) छोटे चैकोने खेत को कागज का पन्ना कहने में क्या अर्थ निहित है? क) भक्तिन के संदर्भ में हनुमान जी का उल्लेख क्यों हुआ है? घ) लेखिका ने भक्तिन को समझदार क्यों माना है? क) बाजार का जादू चढ़ने और उतरने पर मनुष्य पर क्या -क्या असर पड़ता है? ख) इिंदर सेना सबसे पहले गंगा मैया की जय क्यों बोलती? नदियों का भारतीय सामाजिक सांस्कृतिक परिवेश में क्या महत्त्व है ? घ) नमक कहानी में भारत व पाक की जनता के आरोपित भेदभावों के बीच मोहब्बत का नमकीन स्वाद धुला हुआ है, कैसे ? There is no overall choice in class 12 Hindi Core Sample Paper. However, there is an internal choice in one question of 2 marks weightage, one question of 3 marks weightage and all three questions of 5 marks weightage. myCBSEguide have many sets of CBSE Sample Papers for Class 12 Hindi Core for the current session. You can download them from myCBSEguide App too. for latest updates regarding CBSE circulars and exam related information do visit CBSE official website cbse.nic.in or myCBSEguide.com. 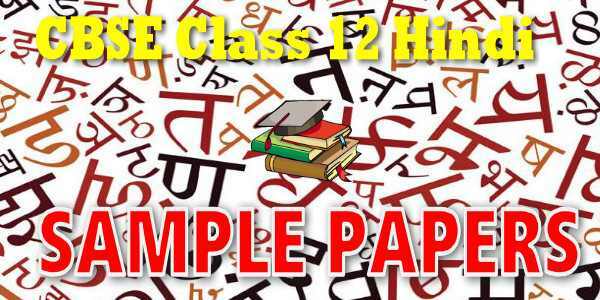 Download Class 12 Sample Papers for all subjects for free in PDF format.